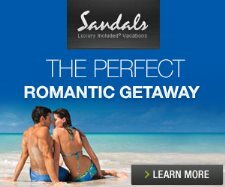 Sandals Negril Crystal Lagoon Pool was constructed to serve the swim-up Crystal Lagoon River Butler Suites within the Sundowner Building. The pool is available to all resort guests and generally features a relaxed and quiet atmosphere. The Crystal lagoon Pool at Sandals Negril was the first swim-up pool within the Sandals brand to feature ocean front views. The Crystal Lagoon Pool is located directly in front of the Sundowner Building serving the swim-up Crystal Lagoon Butler Suites. In addition to the beachfront views, the Crystal Lagoon Pool is surrounded by gardens and lush vegetation. Another view of the Crystal Lagoon Pool.